When you ask someone to name fall colors, they will probably list the traditional warm tones of reds, oranges, and yellows. 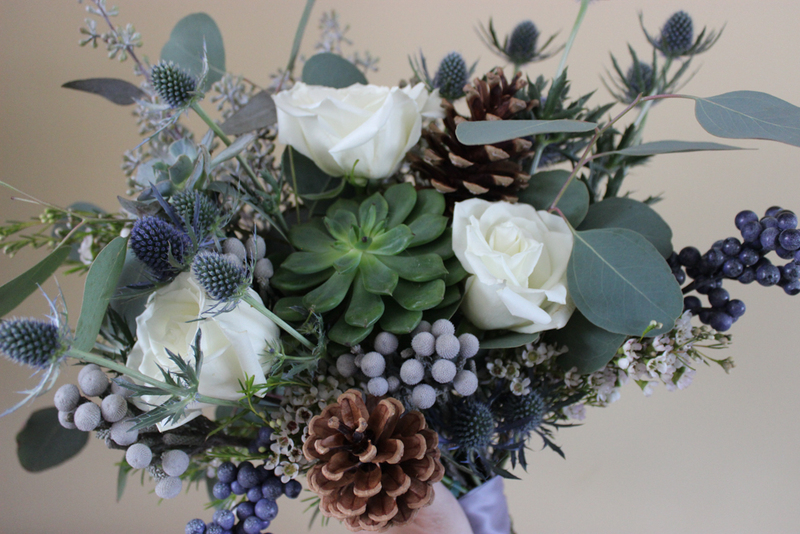 Think beyond that though and there is another palette we often see this time of year with cool blues, grays, and brown wood tones. 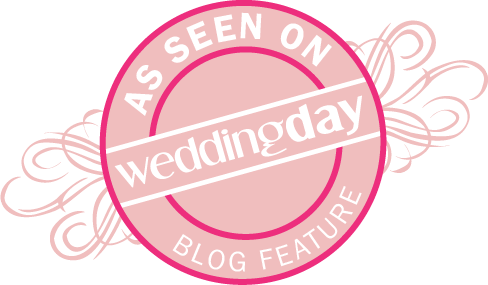 This is the palette we used for Christine and Adam’s wedding at the Bauerhaus. 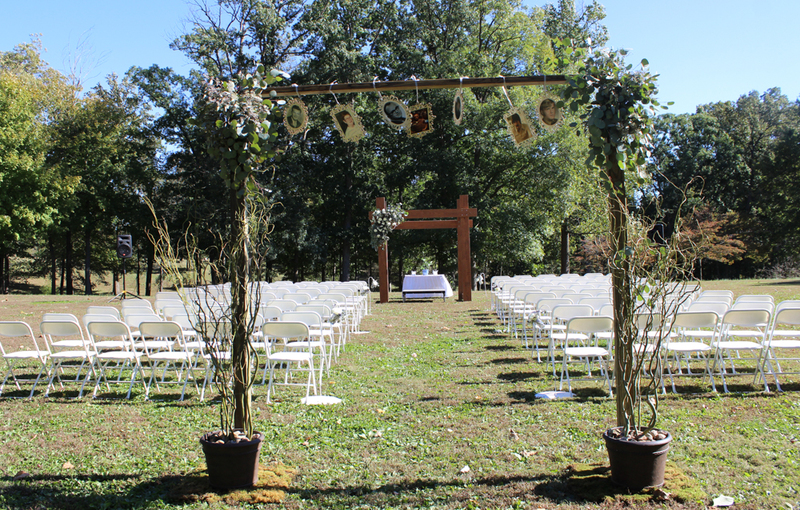 Their outdoor ceremony was held on a sunny, yet windy, day. Most of the leaves hadn’t started to turn so the cool blues and greens fit perfectly with the landscape. I always love to try something new. 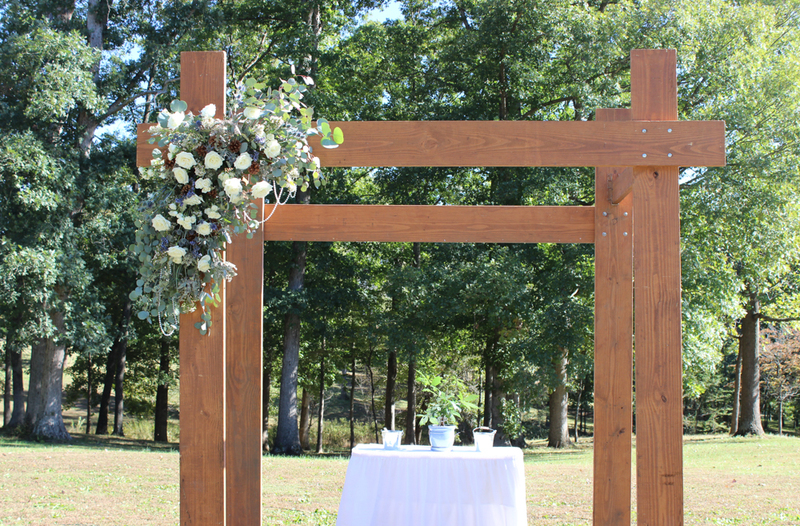 Christine had an idea to have an entry arch that served the purpose that a memory table often does at a wedding. 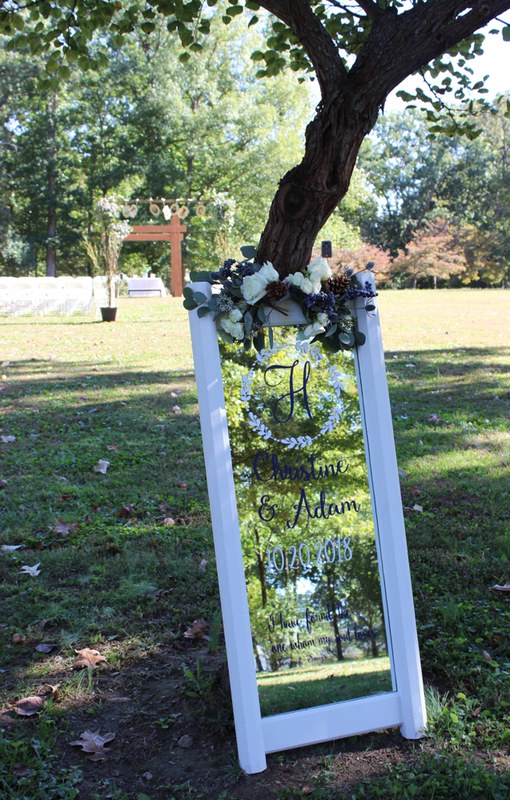 Guests entered the aisle through the arch with photos of family members hanging above them. 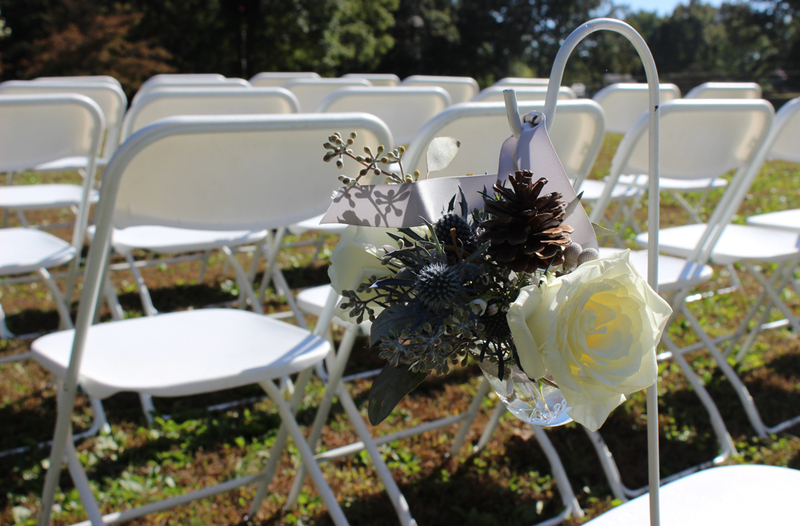 Along the aisle, shepherds hooks held jars with flowers, foliage, and pine cones that were also seen throughout the event design. 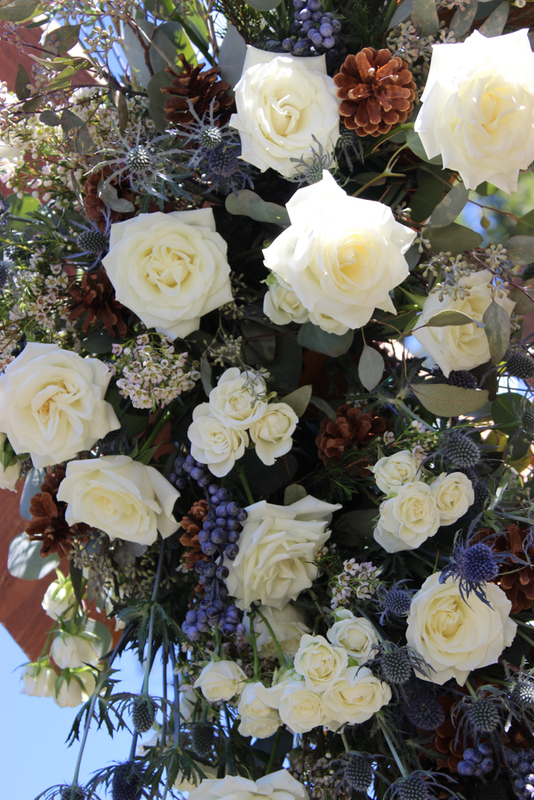 A large floral spray on the ceremony arch was an exclamation point for the area. 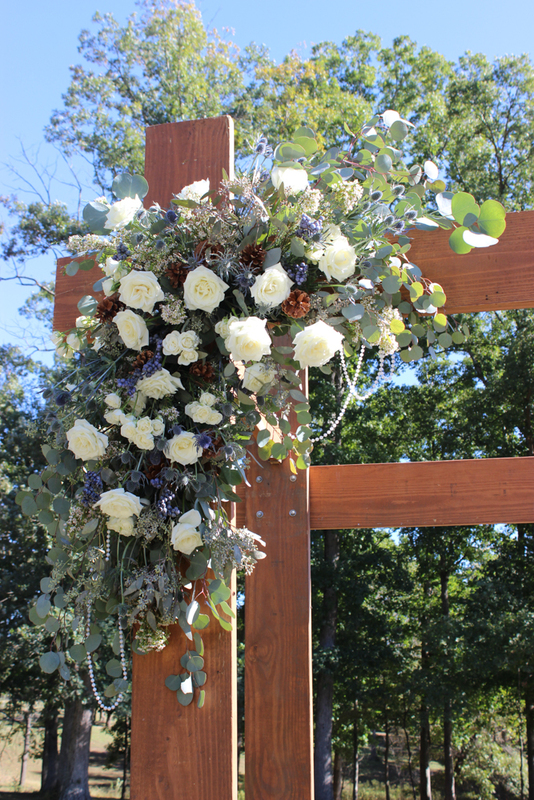 Eucalyptus, roses, thistle, brunnia, wax flower, and pine cones dressed the arch. 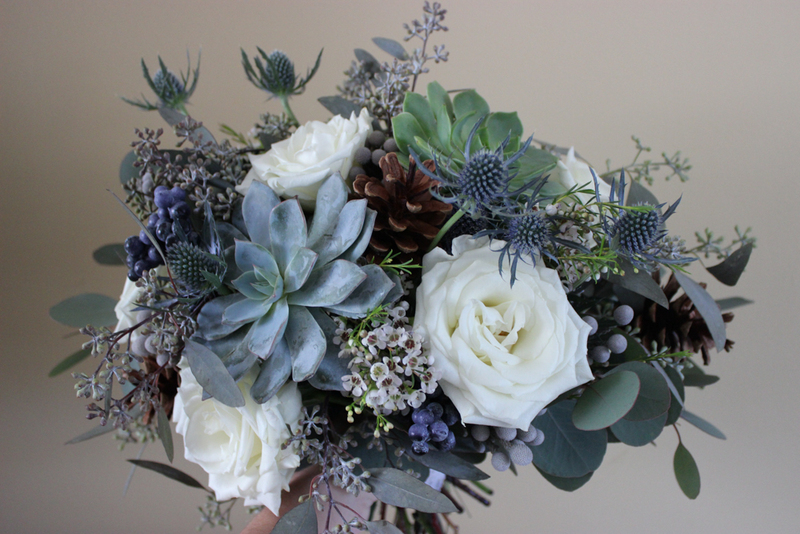 Christine’s bouquet was created with the same flowers and foliage that were seen in the ceremony arch but was also punctuated with large statement succulents. 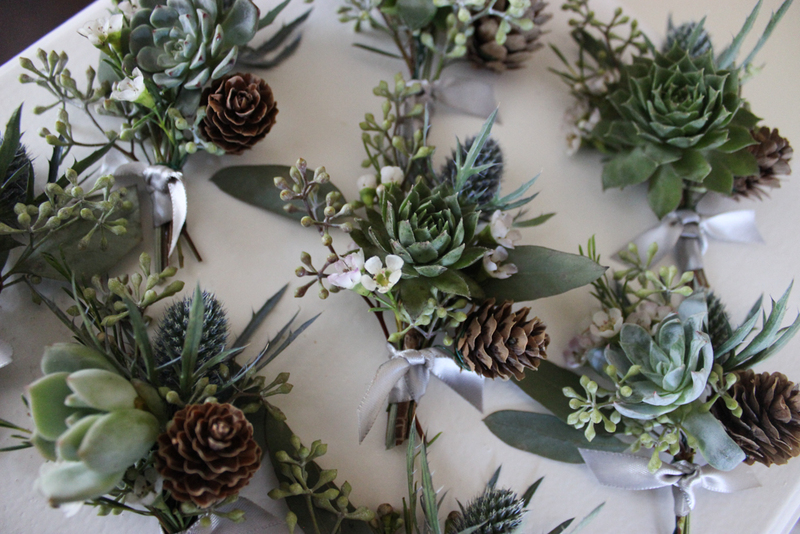 Her bridesmaids carried coordinating bouquets. 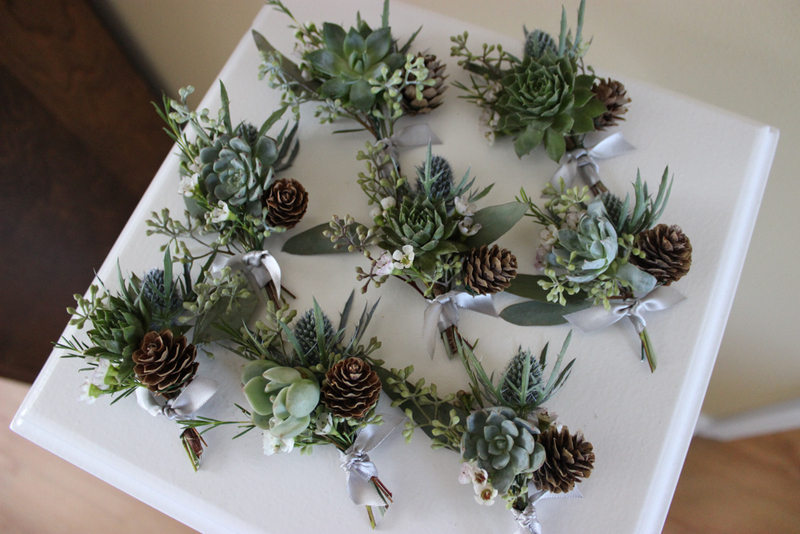 The variations in the succulents made each one unique. 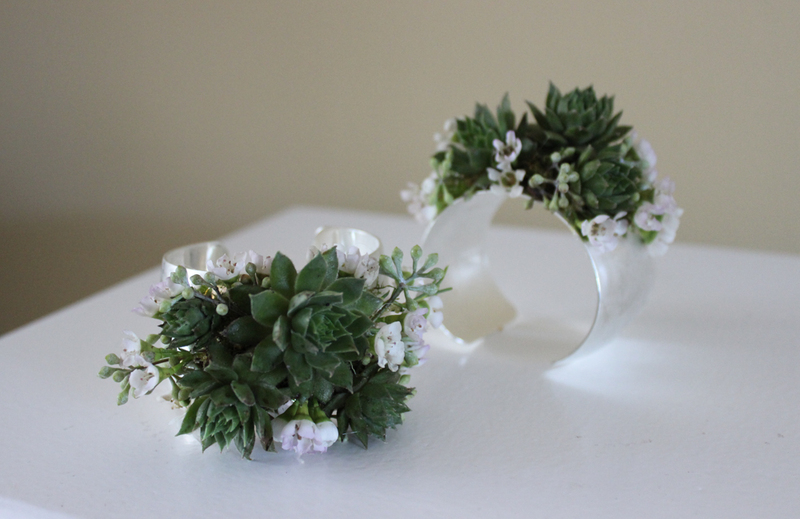 I, personally, am a big fan of succulents so I was happy to incorporate them into the design. 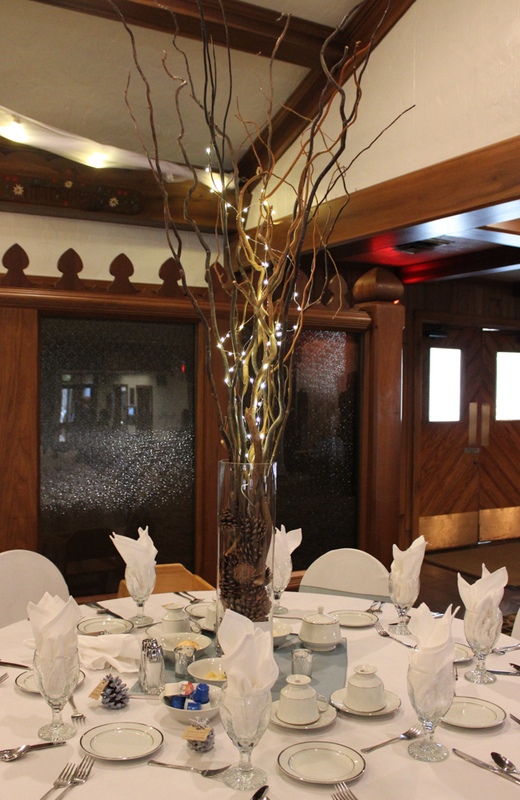 The pine cones were a great accent that coordinated with the decor. The interior of the Bauerhaus is filled with wood accents so the pine cones coordinated perfectly with the reception area. 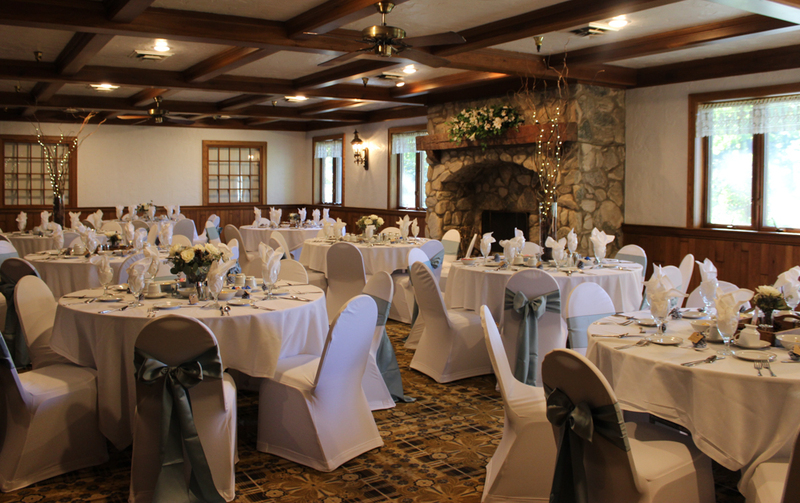 We feel like the overall design is more interesting with a mix of coordinated centerpieces. 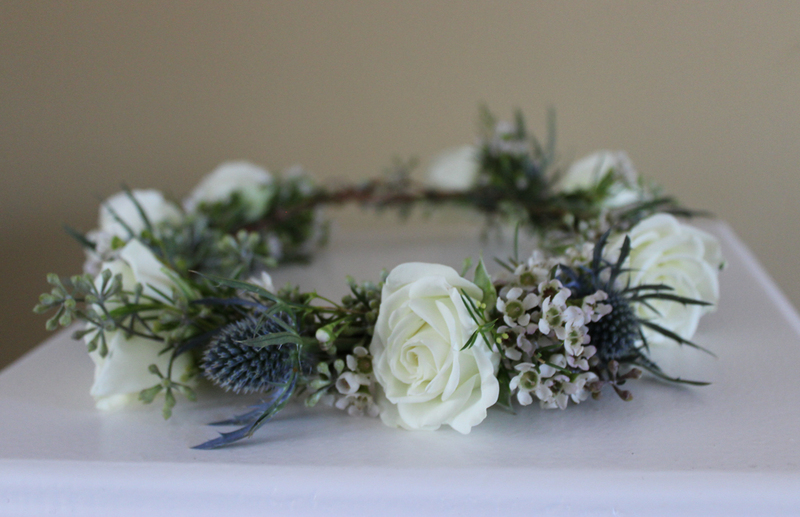 For this event we had three different designs. 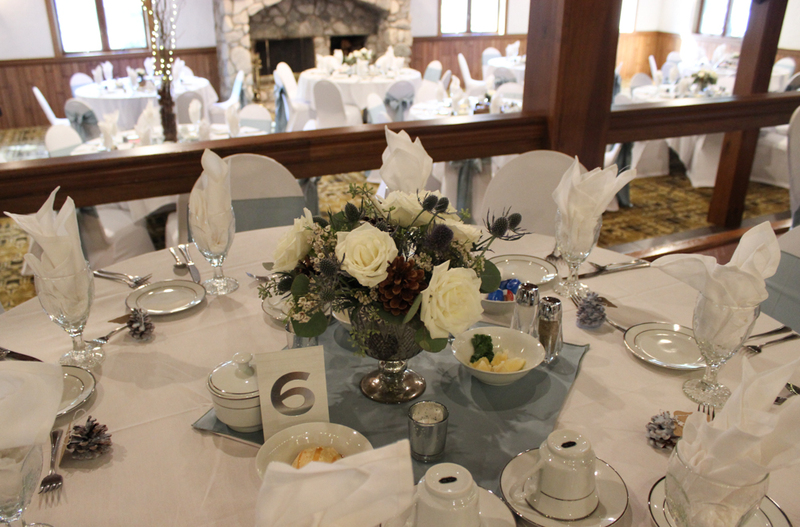 A traditional centerpiece in our silver mercury glass compotes worked perfectly on the tables and matched the silver mercury glass votives on all tables. 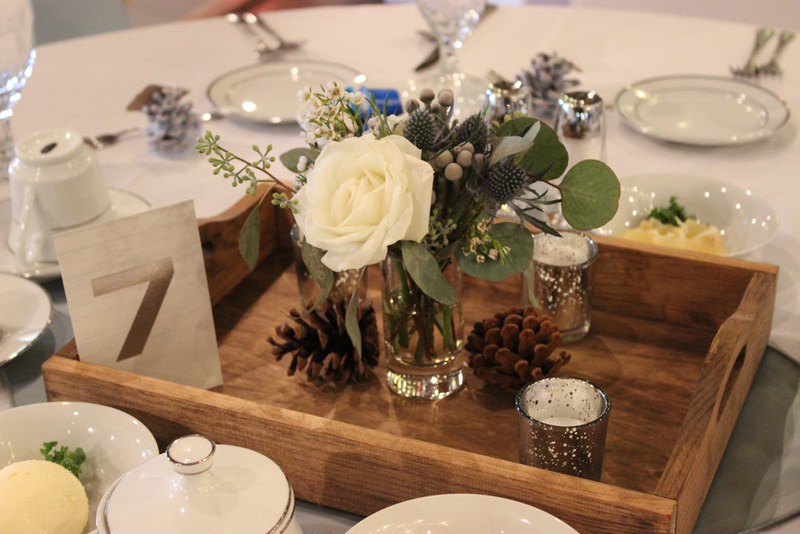 The wood theme was pulled onto the table with our wood trays, a bud vase, pine cones, and candles. 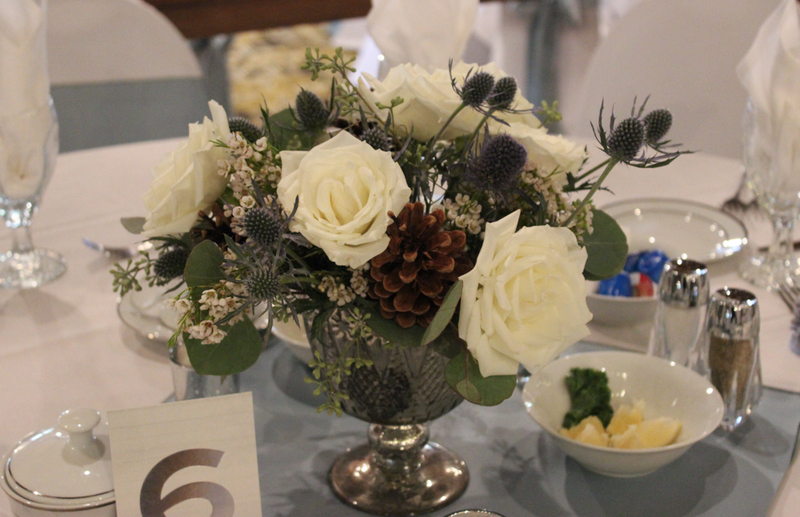 The final centerpiece were tall vases filled with pine cones, curly willow branches, and fairy lights. 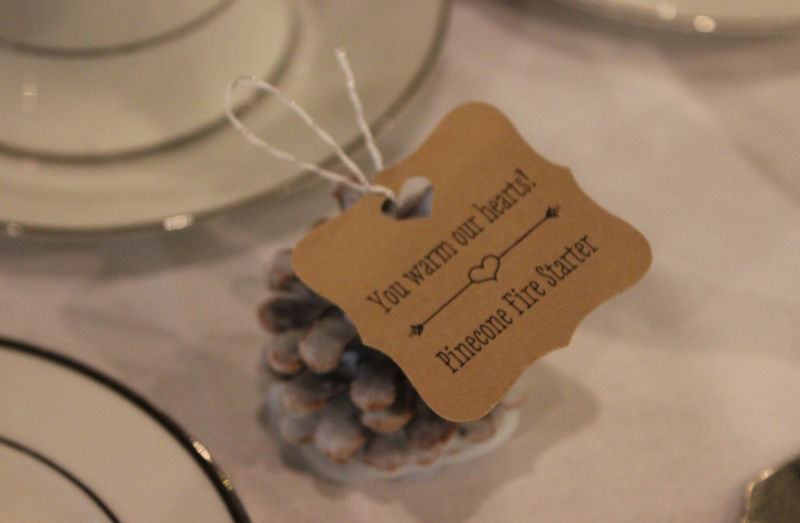 I couldn’t resist taking a photo of the couple’s adorable favors. They fit perfectly with the theme! 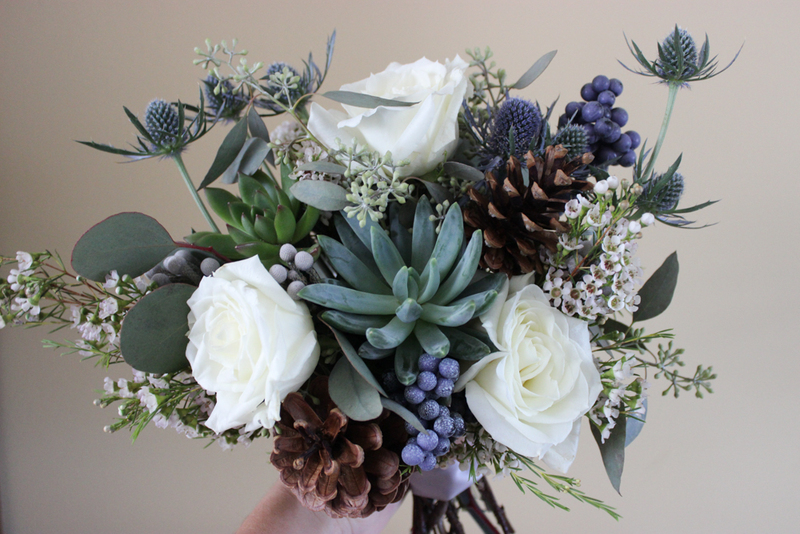 Do you like the cool blue toned fall theme? 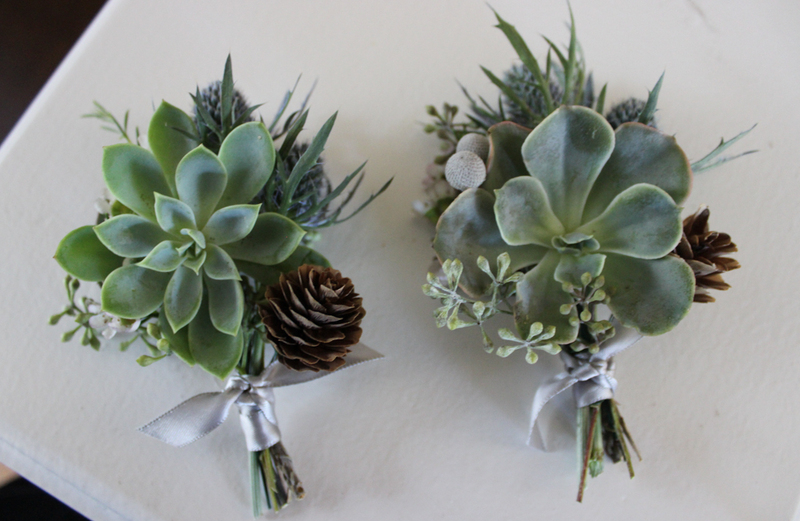 What are your thoughts on succulents and pine cones in decor? 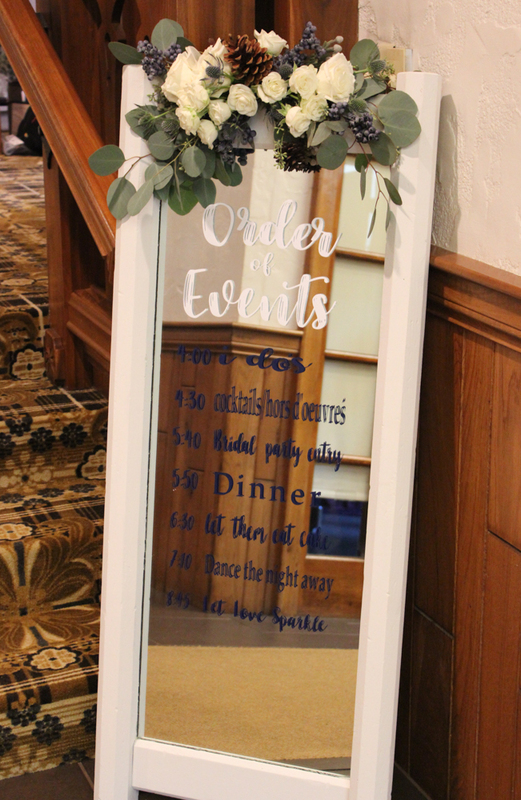 My favorite part of this wedding is that it had it’s own unique touches. I think it is so important for a couple to choose items that are meaningful to them. 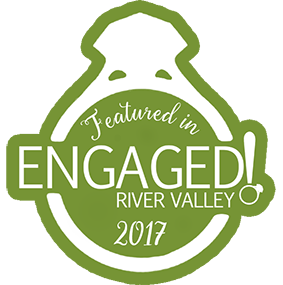 Congratulations Christine and Adam! Thank you for your kindness and being so great to work with! We wish you the best!